Last week’s arrival of this flyer on the doorstep was the first clue many Notre Dame neighbours had about BIG changes proposed for our community. NOTE: The day after the flyer was circulated, Notre Dame School removed the web page mentioned on the cover of the flyer, above (ndrsbuilding.com/the-final-phase). In point 3, there is reference to the original plans being followed (the original plan was for a stadium and was strongly opposed by local residents in 2005). Notre Dame agreed, under community pressure, to the remove the lights from the project. That still stands. But, apart from that, we are “back to the original plan”. Point 6 indicates that they hope to attract up to 2,000 spectators. To reinforce the point made in the brochure, we are NOT against the students of Notre Dame School having a sports field of their own. On the contrary, we can’t really understand why it has take so long for them to get one. What we ARE against, is the possibility of a destination sports STADIUM being brought into our small neighbourhood without our consent or consultation. Supporters of the project say that it not a stadium, merely a field with a few bleachers. 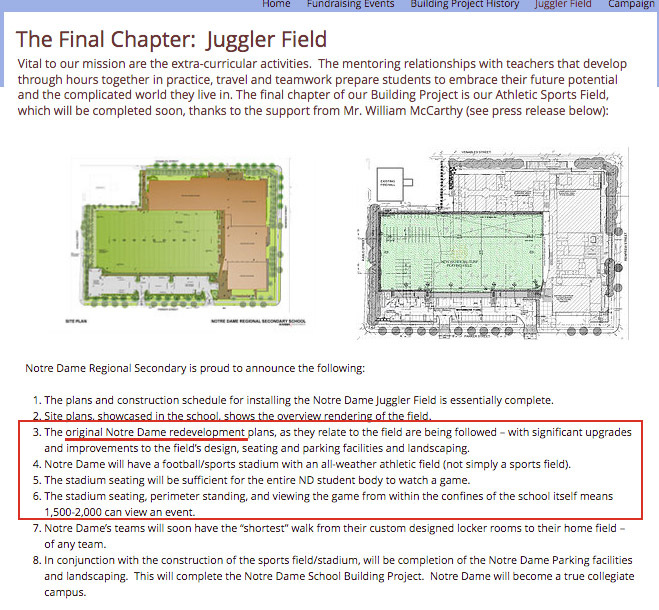 However, the fact that the project is actually officially called the McArthur Stadium, and the statements made on the now-removed Notre Dame online statement, make us skeptical that that a field with a few bleachers is the limit of the plans for the site. Why Will No-One Talk To Us? We are made very uneasy by the lack of communication from the school. Attempts to speak with Notre Dame representatives by email, or in person, have been unsuccessful. Information from the school web site has been deleted as soon as our flyer pointed it out. Letters from many neighbours to the Vancouver City Project Coordinator who is dealing with this permit, Claudia Hicks, have met only with the repeated message that the upgrade of the grass field project (approved in 2008) to an artificial turf field with stadium seating, (meant to host 2,000 visitors, as evidenced from the now removed Notre Dame web site) is a MINOR amendment. Given that this part of the school restructuring will have BY FAR the biggest impact on the immediate community, and given that people who live only feet from the project have received NO NOTIFICATION from the school or the City about the changes about to come, we are still strongly campaigning for a public consultation process before final approval is given to this project. Why is this such a hurried and non-transparent process? The application to amend the permit from grass field to artificial turf stadium was made in February 2018, yet no community announcement was made by the City or the school. As with all things in life, compromise is the best way to proceed. As this situation currently stands, however, the City of Vancouver and Notre Dame School are not open to any compromise, or even communication. We are looking for a way forward — a way in which the students of Notre Dame can have their sports field and we, the school’s neighbours, can retain our sanity. This is a poorly thought out development. A field to play on is encouraged however a 2000 seat stadium is not why people live in this neighbourhood. As Christians love to say “Do unto others as you would have them do unto you” Also perhaps they could ask themselves, what would Jesus do? This is a shameful way to treat their neighbours and it should not be allowed to happen. A sports field yes, a stadium absolutely not. Shameful. We are longtime residents and frankly the new school field does not bother us. We think it will be a nice addition to the neighbourhood.. Anyone vaguely familiar with architectural drawings can also see there are not 2000 seats in the plans. Lets also be serious here. This is Canada, other than a few parents and some friends, who is actually going to bother going to see games at this field, or any field in our city. Yes they seem to have had conflicting information on their website, you would think that Principal might want to get his story straight. What disappoints us the most is 10 years ago the school made this great effort to stay in contact with the neighbourhood while they planned and started construction. In 2010 after they opened their first phase, we all have been shut out. Gone are the neigbourhood meetings held once or twice a year. Gone is a newsletter to us, about events. And gone is the traffic management we were promised when they held their events. Please start soon as we are sick and tired of the dust and the dirt blowing everywhere, but it would be nice if you did not go back on your word! As you say, there are not 2,000 seats in the McCarthy Stadium- there are 740 (according to last information). The school did, however, express a goal of having up to 2000 spectators by combining the 740 stadium seats with outdoor standing room and other people viewing from within the school. Who knows if this is a realistic goal or not for Notre Dame games. But there is always the possibility of the school renting this facility out to groups that might get a bigger audience. In their latest update to the “Operational Notes” on the city permit site, they mention being open to “community use” which could be interpreted as renting it out. If they are going to spend $1.7 million on this project, one imagines they might be looking for ways to make some of that back. We do agree that it is a shame that the “good neighbour agreement” that the school made back in 2006 has long since fallen by the wayside. Emails to the school principal and vice principal and in-person trips to the school have resulted in no response, which does make us feel ignored and somewhat disrespected. It would indeed be nice if they got to work on the grass field they said they were going to build back in 2006. Many students have enrolled and graduated from the school without having any outdoor sports facility at all. We do not oppose a grass field, but the upgrade to artificial turf and stadium seating in inappropriate for this neighbourhood. A full sized football field will take up every square inch of the remaining campus, apart from the new parking area. Other schools in the Vancouver area with full-sized fields have much bigger campuses and are not surrounded on all sides by houses. What we are asking for is neighbourhood consultation on this plan, with a better look at how it will affect parking, traffic and noise pollution for local residents. The goal is get something for the school that we can all live with. Dear Jay and Jayanne: 2,000 spectators in McCarthy Stadium? Where did that number originate? That number came from Mr. R. DesLauriers, the principal of Notre Dame Private School. He said it in a news release to Notre Dame’s benefactors, alumni and student/parent body. Why would he give incorrect information to his own community? Also, why go to the expense of creating a stadium with that capacity if it is not going to be used? McCarthy Stadium will have long-lasting detrimental impacts on our neighbourhood. It will be a “nice addition” to a glossy brochure, but it will be a disaster for our neighbourhood. But why are we having this discussion online? We should be able to discuss this, with the school and the city, in a public meeting. Why aren’t we doing that?